In 1965 batik was yet another craft to be introduced to the children at the center. 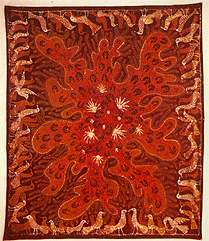 By choosing batik, Ramses wanted to demonstrate that creativity could be brought out through any medium - particularly one that had not been present in Egypt before. A second reason involved the question of the pace of the work. In contrast to weaving, batik requires fast work. Its use of molten wax and phase dying presented a new challenge requiring planning and an altogether different faculty. Those who learned this technique had to be quick of hand and eye. In batik, the cloth is dipped repeatedly into different. dyes which range from clear to opaque. Elements of the design, which are of the same color, are drawn in wax before dipping the cloth into the next dye. Unlike weaving, batik demands that the child should have a complete idea of what he wants to represent before starting work. As with all the other activities at the center, here too the artists do not make preliminary designs. experiment has now continued for over half a century. His daughter Yoanna describes three fundamental elements, which she notes as having assured the success of the experiment through the years. They are, love of humanity, mutual confidence between child and adult, and the patience to give the child the time he needs to develop the gifts which nature has given him. With these three elements, Ramses has shown that given the right circumstance all children have the potential to create. He has taken the children on a creative journey, and thread by thread, has lead them to piece together the beauty of life. This is in essence what all those at the center share through their work - the varied impressions of life and lasting details of beauty.